Although Chanuka is pretty much halfway over I want to share my recipe for these classic donuts. As of a few weeks ago I had never prepared donuts before so it was all new to me. But what is Chanuka without donuts? I'm sure we can all agree. I started trying out a few different recipes as testers and found a recipe of my own along the way. I didn't get it perfect immediately in fact ending up with some that had raw dough in the center- gasp! The most recent batch that I whipped up last night for today's chanuka party are exactly what I was dreaming of from the start. These donuts are so perfect and tiny and almost irresistible! I'm sure you have noticed how much I love mini foods lately. I hope you can still enjoy the recipe over the last bits of what holiday is left or maybe pin it to a chanuka pinterest board for next year or any other time- who says donuts can only be eaten on Chanuka? At some point you NEED to make these. I'm not going to be dishonest here they do need time, energy and perseverance so be ready for that. Also, no need to eat them if you are trying to stick to your diet- I only tasted these, but I can guarantee that if you get them right your guests will love every bite. 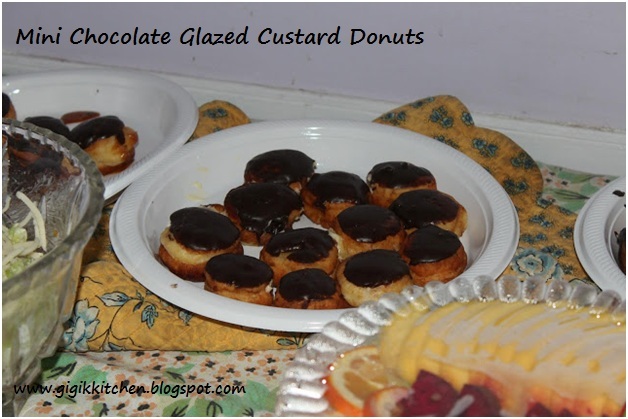 Chocolate glazed custard donuts are my personal favorites and first choice but these can be done in all sorts of variations which you may prefer- powdered with jelly filling, with caramel and whipped cream, or even as beignets with the filling on the outside. Also these specific ones were dairy but can be easily made parve by substituting butter with margarine and milk with water. I didn't make my own custard as I've only had bad experiences with that thus far but feel free to use homemade if you are able. 1. 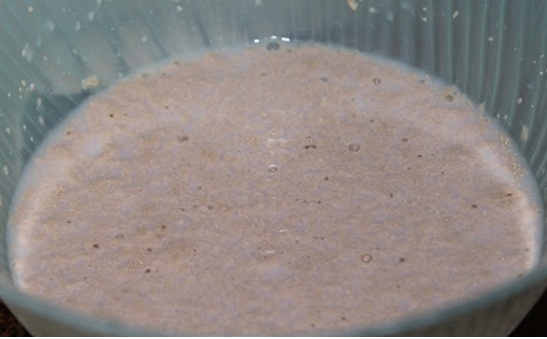 Combine yeast, warm water and warm milk in a small bowl, add a sprinkle of sugar and mix with your fingers a little. Set it aside for 10-15 minutes allowing the yeast to activate and foam up a little. 3. Once the yeast is ready add it to the rest of the ingredients in the large mixing bowl. Mix it all to come together as one large ball of dough. 4. Grease a large bowl and place the dough inside. Cover it completely with plastic wrap tucking the edges in around the dough and place it in the refrigerator for 5 hours-overnight (best) or until it has almost doubled in size. 5. Once it has sat in the refrigerator for a nice amount of time remove it from the bowl and place it on a floured surface. 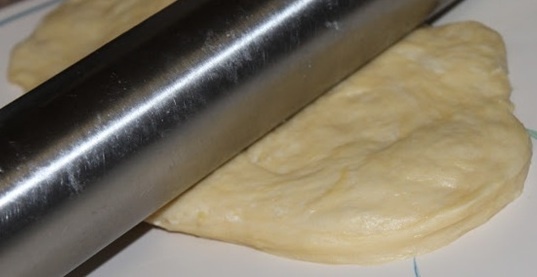 Roll out the dough with a rolling pin to desired thickness. 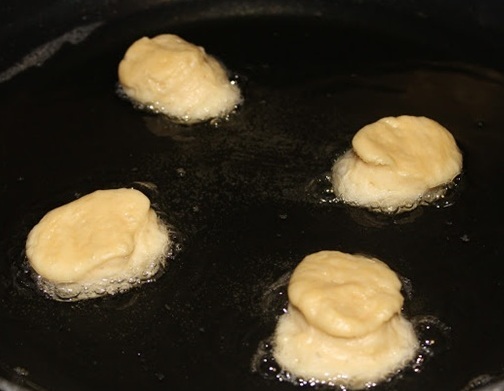 Using a stemmed round glass cut out rounds and place them on a pan with parchment paper until ready to fry. 6. Heat up the vegetable oil in a really large no stick frying pan over a high flame. Once it begins to simmer and bubble lower it to a medium flame and drop about 5-10 pieces of dough in at a time. 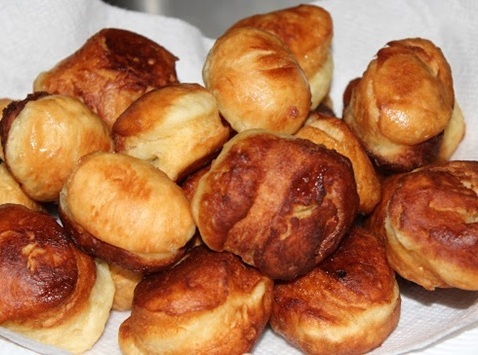 Let them fry for about 40 seconds at the very most and remove them to a paper towel lined plate with a slotted spoon. 7. Once you are done frying them all up it is time to fill them and add a glaze. For the filling I used a new store bought child's medicine dispenser to fill them sucking up the custard, poking a hole in the side of the donut and pushing it in. I did that about twice to fill them. 8. And now the glaze- take the chocolate bar and either put it in the oven on a very low heat or place it over top a pot of boiling water to melt. Then take each donut and dip the tops into the chocolate glaze coating them nicely. If you are worried they'll be a little messy this way feel free to use a pastry brush to top them with chocolate. Put them on a platter and refrigerate for about 20 minutes to set the glaze. What is your favorite kind of donut? Leave me a comment in the form below and let me know! I love to hear from you. Enjoy whats left of the Chanuka holiday! Stay Updated! Subscribe in the left side bar of the blog with bloglovin', gfc or by email to be aware of whats going on at Gigi's Kitchen all the time. Feel free to follow me on twitter & "like" my facebook page for extra inspirations and updates.